Here we are back trying whole fish with skin & bones. At least these don’t have any scales. I should know better with John’s phobia and “breast of….” only motto, but I can’t help myself – whole fish are stunning. 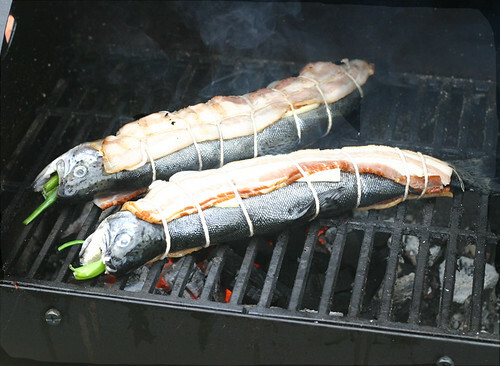 Trout are actually quite a sturdy fish and I was able to pick these up several times in the grilling process. This is another one that benefits from wood lump coal. If you don’t have that throw in some soaked wood chips wrapped in foil with some holes poked in it and let it smoke up a storm. 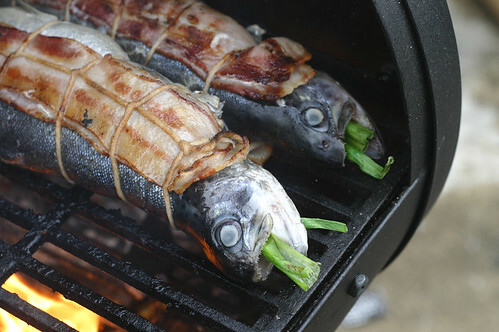 To get the trout ready for the grill rinse them off then put one green onion down the middle on the inside. Place one or two slices of bacon on each side and tie them down. I put two slices on and had to finish the inside off in a frying pan, but the flavor on the fish from the bacon was very good. It’s tough to grill bacon without burning it. Flare ups occur often and you can’t leave your food alone for even a minute. Once the bacon got crisp on each side I moved the fish over to indirect heat to finish it. Be sure to salt and pepper and squirt with a little lemon. The skeleton comes out fairly easy too. Just open up the fish and grab the top of the backbone and pull gently. 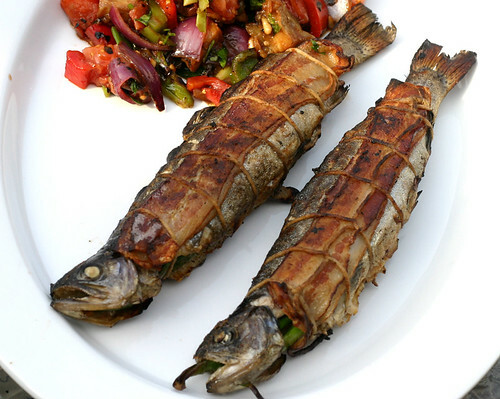 I served these with the Grilled Vegetable Coponata. Enjoy! These look FANTASTIC! I’m gonna have to get me some trout make this. 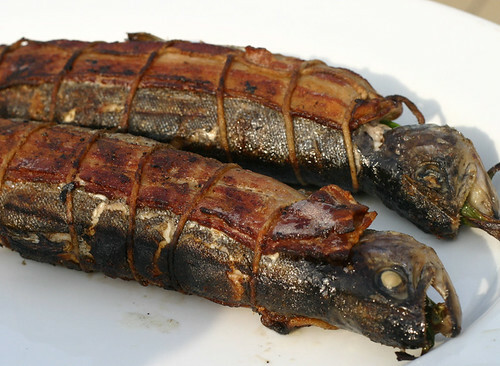 Did you season the inside of the fish before encasing them in bacon? Actually trout do have scales but they are very small and can be removed with a few rubs of the back of a knife. You can also remove the heads for those that can’t eat something looking at them. I have found the best place to cook trout is 20 feet from the stream moments after they are caught.